The picture released Thursday shows Ultima Thule — officially named 2014 MU69 — in sharper detail than images downlinked by the New Horizons spacecraft in the hours and days after its encounter in the Kuiper Belt on Jan. 1. While the earlier images showed Ultima Thule’s shape and color, they did not have the resolution to discern finer details, such as craters and textures scientists are eager to see in their quest to better understand how icy, rocky material coalesced to form bigger objects, eventually forming the solar system’s planets. The picture released Thursday was captured by the Multicolor Visible Imaging Camera component of the Ralph instrument on the New Horizons spacecraft at a distance of around 4,200 miles (6,700 kilometers) from Ultima Thule, just seven minutes before the probe’s closest approach to the object in the Kuiper Belt at 12:33 a.m. EST (0533 GMT) on Jan. 1. The New Year’s flyby made Ultima Thule the most distant object ever explored from close range. 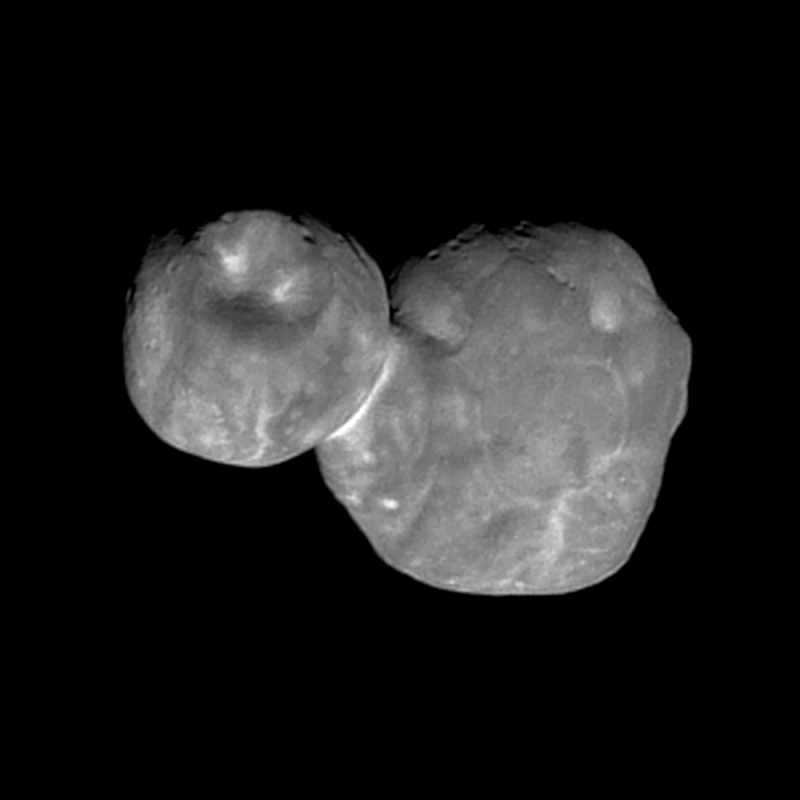 Ultima Thule was not even known to scientists when New Horizons launched in 2006. Located a billion miles beyond Pluto — the New Horizons mission’s first flyby destination in 2015 — Ultima Thule was discovered in 2014 by astronomers using the Hubble Space a Telescope. 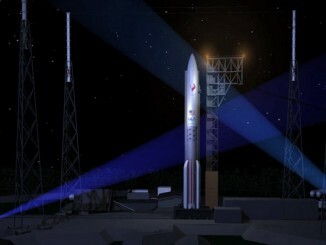 In a press release accompanying the image Thursday, officials said the oblique lighting of the new picture reveals topographic details along the day/night boundary, or terminator, near the top of the picture. Scientists have identified numerous small pits up to 0.4 miles (0.7 kilometers) in diameter, and the higher-resolution image has also revealed a larger circular depression measuring about 4 miles (7 kilometers) across on the smaller of Ultima Thule’s two lobes. “Not clear is whether these pits are impact craters or features resulting from other processes, such as ‘collapse pits’ or the ancient venting of volatile materials,” officials wrote in the press release. Scientists believe two objects formed independently and merged in a slow-speed collision to create Ultima Thule, which measures around 21 miles (34 kilometers) long on its largest dimension. Scientists are referring to the larger of the object’s two lobes as Ultima, and the smaller one as Thule. Stern said earlier this month that the New Horizons science team will submit formal naming proposals for the object, and its surface features, to the International Astronomical Union later this year. Each lobe appears roughly spherical in shape, and the larger body has around 2.6 times the internal volume as the smaller lobe, according to the first scientific paper written after the New Horizons flyby. Ultima Thule is the first object of its kind — a category of planetary bodies scientists call a “bi-lobate contact binary” — ever explored by a spacecraft so far from Earth. The object is also part of a population of objects in the Kuiper Belt — a ring of dwarf planets and smaller chunks of rock beyond the orbit of Neptune — called “cold classicals,” which have remained in the same zone of the solar system in which they originally formed some 4.5 billion years ago. The planets, comets and other objects have drifted closer or farther from the sun through the solar system’s history. Another famous contact binary object, Comet 67P/Churyumov-Gerasimenko, was visited by the European Space Agency’s Rosetta spacecraft from 2014 through 2016. Stern and members of the New Horizons team wrote in a paper Jan. 9 that Ultima Thule’s appearance is consistent with a relic planetary body possibly created by the collapse of a pebble cloud in the outer solar system. “How MU69’s two lobes merged, how gently, and how angular momentum was lost prior to final contact are puzzles to be solved as more data are returned and detailed modeling can be undertaken,” Stern and other scientists wrote in the Jan. 9 paper. New Horizons detected no signs of a moon or companion to Ultima Thule, although there are more images still to be analyzed. Scientists in the Jan. 9 paper also wrote that the spacecraft’s dust counter registered no impacts during the closest part of the flyby sequence. 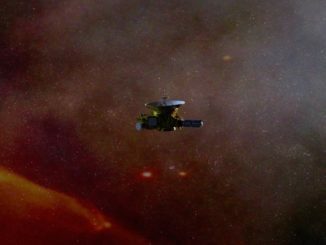 It will take around 20 months for all of the New Horizons flyby data to come back to Earth due to the vast distance and slow transmission rate between the probe’s antenna and receiving dishes on the ground. The image released Thursday was radioed back to Earth on Jan. 18 and 19, after controllers restored contact with New Horizons following a scheduled interruption that began Jan. 4 as the spacecraft was too close to the sun in the sky to allow for reliable communications. 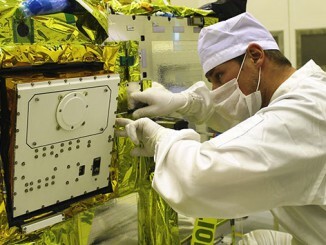 The data stored in the spacecraft’s data recorders will stream back to scientists a little faster than 1,000 bits per second. The data downlinks will not be constant, as the probe conducts other scientific observations and NASA’s Deep Space Network antennas support other interplanetary missions. New Horizons is currently 4.13 billion miles (6.64 billion kilometers) from Earth. At that distance, a radio signal takes six hours and nine minutes to travel from New Horizons back to Earth. The final data from the Ultima Thule encounter is expected to arrive on Earth by September 2020.